Tight Joints Plus has been researched and in the process of development for over 20 years! It contains 6 ingredients to support comfort and fight inflammation! Many users become DEALERS! Use it and see why! What Was The Inspiration For Tight Joints Plus? 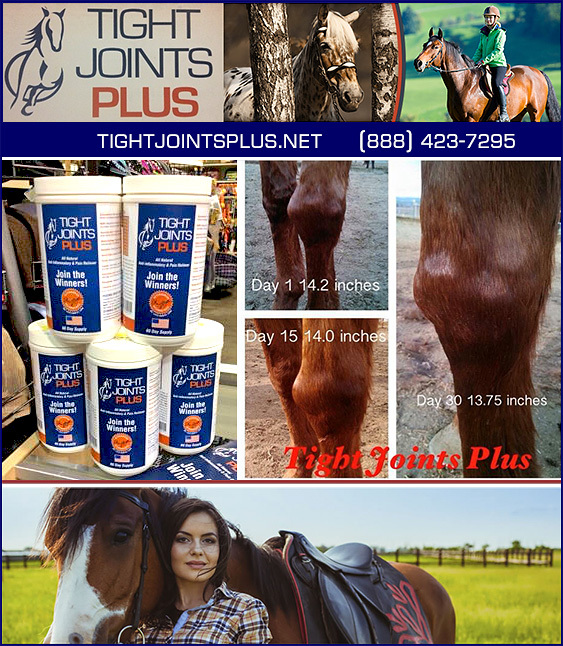 The creator of Tight Joints Plus, Tony Loften, is a horseman with 30 plus years of experience with race and barrel racing horses. Tony was not looking to create a product for retail, he wanted a product that would work on his own horses, without having to turn to the vet every time he needed a joint issue or pain issue treated. He had tried many joint products that claimed to treat joint issues without success. He knew it was time there was a joint supplement on the market that not only treated minor joint issues but also severe issues and overall made horses feel better. Tight Joints Plus was an idea to take your everyday joint supplements, natural pain relieving supplements, HA supplements, and combine it all together as one, with amounts of each ingredient that would make a difference. Not only will our supplement help you to manage pre-existing conditions, it can also help to prevent future damage by making your horse more comfortable each and every day! What Sets Tight Joints Plus Apart From Other Joint Supplements? Tight Joints PLUS's combination of ingredients were put together for maximum efficacy. It works first on the inflammation with the 6 ingredients to support comfort and fight inflammation. Anytime there is inflammation, your horse will experience discomfort, so we added natural ingredients that support comfort and relief to your horse. When the inflammation is gone then the 6 joint rebuilding ingredients can go to work repairing. You will not find another product on the market that has this combination of ingredients, with the levels of active ingredients in a single dose. This is why it works!! What Are The Ingredients In Tight Joints Plus? How Does Tight Joints Plus Work? What Benefits Do These Ingredients Offer and How Where They Formulated? The equine nutritionist that formulates Tight Joints Plus has studied for many years that in order for joint supplements to work the first step is to reduce the inflammation. When the inflammation is gone the joint repairing agents can begin to do their job. The lubricating ingredients of Tight Joints Plus help the joint with just that, lubrication to prevent inflammation and cartilage damage. Glucosamine- The basic building block of connective tissues and fluids. Works in treating osteoarthritis and rebuilding damaged cartilage. MSM- Natural anti-inflammatory, helps with arthritis pain, increased circulation, and also benefits soft tissue. Ascorbic Acid- Powerful antioxidant, reduces the level of uric acid in the body which can lead to arthritis and joint pain caused by inflamed joints. Shark Cartilage- Reduces inflammation, regenerates worn cartilage, reduces pain, & stiffness. Copper - Anti-oxidant, required for the development, repair, and maintenance of joints, soft tissue, and other connective tissue. Hyaluronic Acid- Enhances healing, anti-inflammatory, repairs cartilage damage, and improves joint function. Manganese- Necessary for cartilage formation. What Is The Recommended Feeding Dosage For Tight Joint’s Plus? Tight Joints Plus is a Powder and has a 1/2 ounce scoop included in the container, feed 1 scoop for the first day for horses to get used to taste and texture. Day 2 through Day 14 feed 2 scoops and then go to 1 scoop on day 15 for maintenance. 2 scoops is recommended for when a horse has acute inflammation. Is It True That Many Tight Joints Plus Dealers Are Customers? Yes, many of our dealers are very satisfied customers and have been using it long before it was available through feed stores. In fact, that is how we got our start in the stores. Store owners were buying it for their own personal use and they wanted to carry it. What Is The Difference In The “Show Formula” Of Tight Joints Plus? The show formula does not have Devils Claw in it. If you are involved in USEF events, then the show formula is the way to go as it will not ’test’. We want to be able to help horses in every discipline and level of competition. We realize with certain types of shows and competitions comes restrictions to what you can give your horse to alleviate them from pain and arthritis. With this in mind we designed the the show formula to meet the USEF guidelines. We removed the Devils Claw and increased the amount of MSM. Ultimately we replaced one anti-inflammatory with another. Whether you want to feed the show formula year around or feed the regular Tight Joints Plus the majority of the time and switch to the show formula a period of time before the show, we have made it possible to keep your horse feeling its best while abiding by the USEF rules. Can My Horse Enjoy The Benefits of Tight Joints Plus For As Little As 89 Cents Per Day? Yes! Despite the tremendous results, Tight Joints PLUS is very affordable. It was made BY Horse owners, FOR horse owners— that want the best in results and comfort for their horses. It can be fed for as little as .89 cents per day. Is There A Case Study To Read About? We did a case study on a 19 year old Thoroughbred Gelding that was injured on the track as a 4 year old. Many products were used over the years to reduce the inflammation and the size of the knee to keep him comfortable during his second career. Eventually nothing was keeping him comfortable anymore and he was no longer sound enough to ride let alone compete. In just 30 days on Tight Joints Plus the gelding is not only sound again but you can visually see the results! No other supplements or pharmaceuticals were used in the 30 days, only Tight Joints Plus. He is now sound and being ridden in preparation to compete again. What Do Horse Owners Say About Tight Joints Plus? Last summer we started using Tight Joints PLUS on my 14 year old gelding "Dude", my 7 year old mare and our 5 year old that had a suspensory injury. With in two weeks of starting Dude on it he was winning WBRA Opens and running mid 17's again. He even wanted to run hot laps to warm up in between double header barrel races... his normal M.O. is to make me feel guilty by acting exhausted if I had to run him twice. My 7 year old started needing hock injections at 5 and hasn't been injected since we started her on this supplement and our 5 year old has not had any problems with his leg since his injury. We are very happy with Tight Joints PLUS. They eat it no problem, we only have to feed it once a day and we can give it to more then one horse because WE CAN AFFORD TO! I have been an equine veterinarian for over 20 years which includes treating top level performance horses. I recommend Tight Joints PLUS to all of my clients as my preferred joint supplement. You can really see the difference it makes in a horse and my clients love it. I bought Tight Joints Plus only 1 1/2 weeks ago and my horse is already showing me such great progress! He is an older guy with a bone chip in his knee, he has much more flexibility in the joint and is much smoother when riding him. For the first time in a long time he bolted out of my hand when I was turning him out, which usually would make me angry but I was so excited to see him feel well I didn't even care =0) Thank you for allowing me to find something so reasonably priced that makes my guy feel so great! Order Tight Joints Plus Today For Your Horses and See The Difference! Doesn’t your horse deserve the best? Tight Joints Plus has been on the market since February 2012, the success stories of what this product has done for so many horses, as well as dogs, are more than anyone could have imagined. We believe in this product 100%, not only for your horse but for our own. Trust in our equine joint and pain management supplement for lameness issues, and we'll show you just what your horse is capable of. Call us and order today— your horse will thank you.